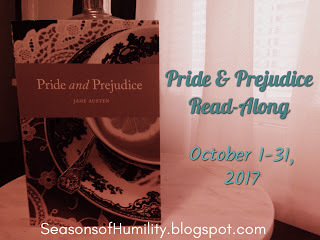 So much has happened in this weeks reading of P&P! Head over to our host Amber's blog Seasons of Humility to read her summary of the characters so far. I'm a little lost in the e-book that I am reading as it isn't broken into volumes like the other versions seem to be. I am going by chapters so hopefully I am caught up. I can't remember if Mr. Darcy's letter to Elizabeth was in last week's reading or in this week's, but I find it interesting that in several of the Jane Austen books that I have read that a letter is written to explain a characters behavior or such. I love it! My husband and I wrote letters back and forth before we were married, even though we saw each other almost every day! But this is not a love letter that Mr. Darcy writes. It is a response to all that Elizabeth accused him of when he proposed to her. I loved his letter so much! It was written with dignity and class. Maybe a bit of pride too, but he is setting the record straight for her and I like it! I liked it so much that I highlighted the whole thing! Even though Lizzie doesn't want to she soon sees her folly in believing in everything that Wickham claimed about Darcy. "She was NOW struck with the impropriety of such communications to a stranger, and wondered it had escaped her before. She saw the indelicacy of putting himself forward as he had done, and the inconsistency of his professions with his conduct." "She grew absolutely ashamed of herself. Of neither Darcy nor Wickham could she think without feeling she had been blind, partial, prejudiced, absurd." "I have courted prepossession and ignorance, and driven reason away, where either were concerned. Till this moment I never knew myself." I love that last quote. Such an awakening for her! "To this Mary very gravely replied, Far be it from me, my dear sister, to depreciate such pleasures! They would doubtless be congenial with the generality of female minds. But I confess they would have no charms for ME--I should infinitely prefer a book." AMEN SISTER! "Thought I shall always say he used my daughter extremely ill; and if I was her, I would not have put up with it. Well, my comfort is, I am sure Jane will die of a broken heart; and then he will be sorry for what he has done." I also loved how it didn't take Lizzie long to realize that Miss Darcy wasn't proud, but she was shy! And she therefore treated her kindly. Oh Bingley's sisters are just rude! To even come close to mentioning Wickham's name in front of Miss Darcy was pushing the bounds of propriety. They think themselves above everyone, but yet the stoop lower than anyone! Oh the poor Bennet family and Lydia's indiscretion! That girl was trouble from the get-go!The result of a mother that is too foolish and indulgent and a father who is absent and who subjects his family to mockery. They were asking for trouble with Lydia. And then that letter from Mr. Collins! Oh my goodness! If I didn't like that man before, I certainly can't stand him now! What do you think about this quote in his letter? "The death of your daughter would have been a blessing in comparison of this." HOW HORRIBLE to say something like that to grieving parents! And he's a minister!!!! Awful awful man! Even though I think Mr. Bennet is lacking in his fatherly skills he still makes me laugh! Then his whole speech about Kitty not being able to do anything or go to dances etc. cracked me up. He's really all bluff, but maybe he learned his lesson? "Well, well, said he, "do not make yourself unhappy. If you are a good girl for the next ten years, I will take you to a review at the end of them." Poor Kitty is now going to suffer the consequences of Lydia's poor behavior! That closes out this week's reading. We will be discussing the end of the book next week. Lots of good stuff still to come!!! "Who do you think has changed the most since the beginning of the story? What are some examples of how he or she has changed for the better or for the worse." I'd say both Lizzie and Darcy have changed. Mainly in each others eyes. They have both discovered more about themselves and more about each other. Both have had their pride pricked and their prejudices challenged and changed. So many fantastic observations about the characters and happenings in this section! From your thoughts on Lizzy's revelations about Mr. Darcy and herself, to this brilliant line about the Bingley sisters: "They think themselves above everyone, but yet they stoop lower than anyone!" Great point! Thank you for sharing your thoughts, and I look forward to hearing what you think of the end!